The Dominicans, after 800 years, still run today worship in the Basilica by offering an important reference for visitors and faithfuls. The church of Santa Maria Novella has very ancient origins. In the sixth century A.D. the city of Florence was in a deplorable state of abandonment because of the invasions of the Germanic peoples and the sad consequences of the Greek-Gothic war between Ostrogoths and Byzantines, which raged throughout the Peninsula. In this scenario the terrae novellae, or the lands reconquered and restored to fields, acquired a new value. Among the cultivations of vines at the gates of Florence there was an oratory, called Sancta Maria inter vineas (or among the vineyards), known from the tenth century onwards with the title of Santa Maria Novella. 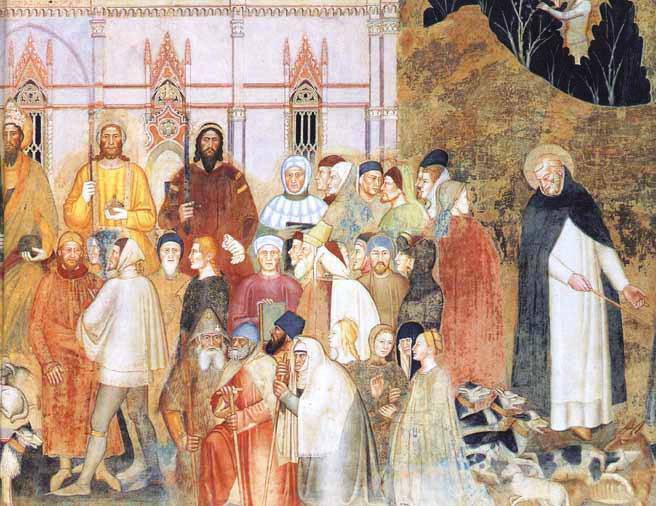 In the early years of the thirteenth century the friars belonging to the order of Preachers arrived in Florence,also known as "Dominicans", led by Friar Giovanni da Salerno. The friars succeeded as able preachers to transform the small church into a fulcrum of the spiritual recovery of Florence. The building and the square in front of it were extended after the 40s of the same century, following the success of the preacherFra Pietro da Verona, a valiant opponent of the Cathars, who was martyred on Easter Monday in 1252 near Vigevano. The Dominicans distinguished themselves in the study of philosophy, theology and the Holy Scriptures, as well as in the study of mathematics and astronomy. The Florentine convent soon became a point of reference for city life, thanks to the culture of its friars and their academic commitment, but also thanks to their involvement in the city's political life. The motto of these friars was 'Contemplari et contemplata aliis tradere', in other words 'Contemplating and offering to others the fruit of contemplation', which explains the program of life of their founder, the Castilian Domenico di Caleruega (1175? -1221). At the end of the 13th century the convent of Santa Maria Novella became the seat of the 'Studium Generale', a university by all means, able to grant academic titles, recognized throughout Christianity. Soon the premises of the convent had to be enlarged to house the precious books kept in the rich library, built in the first half of the fourteenth century by Fra Jacopo Passavanti, to whom the current Dominican Library of Santa Maria Novella is dedicated. As in all the convents of the domincans, like in Santa Maria Novella, praying, studying and evangelization were integrated harmoniously. Today the Dominicans continue to play an important spiritual and cultural role by welcoming in their basilica visitors and faithful who wish to know their history and charisma. Want to know more about the history of the Order?